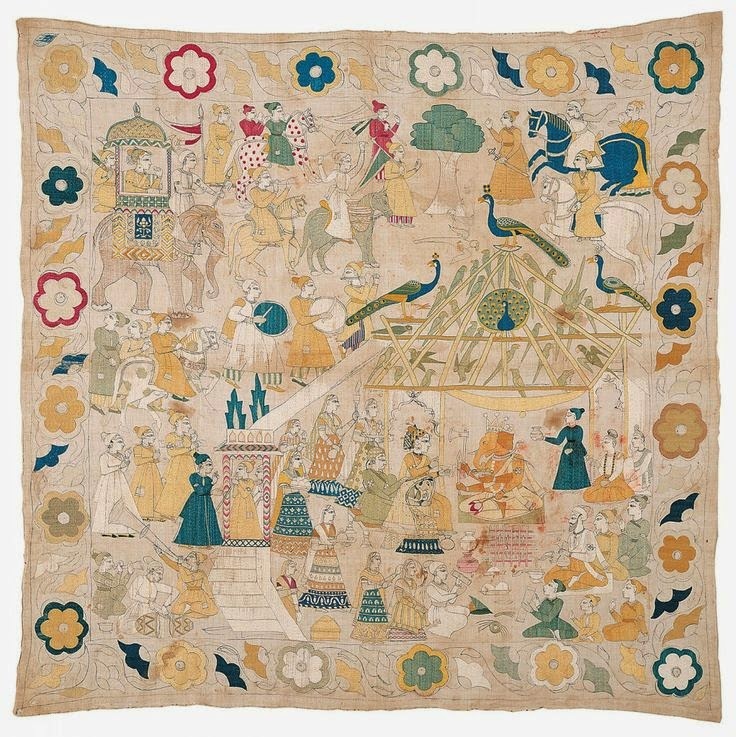 Represented here is a rumal or square, embroidered ceremonial cloth depicting a royal Hindu wedding. Believed to have been designed by a court painter and executed by palace embroiderers, this cloth is a really exceptional example. Today you can find it at the Virginia Museum of Fine Arts along with one of the most extensive collections of South Asian and Himalayan arts in the U.S.
Notice all of the striped pants worn by the musicians and other members of the entourage? There's just a terrific sense of decorative pattern repeated throughout the entire scene. Horses are spotted, flowers are abstracted and surprisingly mod in appearance, and of course the maharaja (the groom) is riding in on a completely decked out elephant. In the VMFA's huge catalogue, The Arts of India, by curator Joseph M. Dye III., the softly-colored scenes -- rendered with dyed silk, silver metal foil and ink on cotton -- are likened to India's iconic miniature paintings with overlapping and diagonal recession. Btw: Rumals are associated with the Punjab Hills and sometimes covered the gifts exchanged between a bride and groom.